Posted as discussion document for Cretaceous Subcommission at NCS website on 10.6.2014, figure adapted 03.02.2015. The 3D model of the subsoil in Flanders requires a complete stratigraphic subdivision for all rock units encountered (Matthijs et al., 2013). The Brabant Massif is overlain by white chalks, assigned to the Nevele Formation (Dusar & Lagrou, 2007). South of the axial zone of the Brabant Massif, overlying the Brabant Parautochton the subcropping Cretaceous strata become more diversified and connect to the Cretaceous in the Nord and Wallonia. Although the general stratigraphic framework can be applied, and more particularly the connection to the lithostratigraphic scale developed for the new geological map of Wallonia is rather obvious, the further subdivision is based on different criteria: observations from exposures in Wallonia, from boreholes with geophysical well logs in Flanders. As long as correlations at the member level are not secured, a regional set of lithostratigraphical subdivisions has to be applied for the 3D geological model of Flanders (Lagrou et al., 2011). 2.1. Name: Derived from De Seule hamlet, old commune of Nieuwkerke (Heuvelland), location of borehole 110W0007. 2.2. Stratotype: Borehole GeoDoc 110W0007 (ex 095W0152), Nieuwkerke De Seule, drilled 1984 by VMW (De Watergroep) as their cored borehole K10 (cored in underlying Paleozoic section only). Lambert coordinates x = 40290, y = 157985, z (ground level) = 19,50 m; depth interval: 146 - 173 m. Stratotype selected because of representative geophysical well log (gamma-ray only). Parastratotype: Borehole GeoDoc 095W0153, Nieuwkerke-Noordhoek. Lambert coordinates x = 40880, y = 162250, z (ground level) 32 m; depth interval 192 – 218,20 m. Parastratotype selected because of presence of cored section over the corresponding depth interval (but no geophysical well logs). 2.3. Description: Cuttings (110W0007) consist of desintegrated bright green marly silt, becoming dark coloured and more cohesive with depth; dispersed clasts of reddish brown clay; coarse quartz grains and mollusc shell debris increase with depth. The reddish brown clay bears some resemblance to the underlying Paleozoic strata which consist of violaceous shales. Mesofossils are characterized by a high frequency of foraminifers for an overall low number of bioclasts in the 1 – 2,4 mm mesh range (Felder, 1990, 1994). Cores (095W0153) display two subunits. The upper subunit consists of green silty marl, originally stratified but bioturbated, fossil-bearing (oyster shells, Inoceramus, sponge structures), displaying dessication cracks, interbedded with ca 25 cm thick layers in bright green indurated silty chalk with poorly preserved mollusk shells, sponge structures, fish remains. The lower subunit displays thin lenses of calcarenitic glauconite-bearing chalk, partly silicified, interbedded with green marl, quickly becoming predominant and also more coarse-grained and richer in glauconite. Towards the base, but dispersed in the sediment, reworked pebbles of Cretaceous origin. Microfacies analysis from thin sections indicate an outer shelf depositional environment composed of bioclastic wackestone with foraminifers, calcispheres and molluscs (subunit 1 at 193.9 m) and bioclastic packstone with coarse glauconite grains and lithoclasts (subunit 2 at 216.1 and 217.6 m). Porosity values from image analysis attain 0,15% and 1.6% respecively (Lagrou et al., 2011). The natural gamma-ray log delineates these two subunits. The upper subunit (underneath a gamma-ray peak at the base of the upper member) is still of chalky-marly nature with rising gamma-ray readings towards the base, indicative for increasing glauconite content. The lower subunit is characterized by overall very high gamma-ray reading, indicative for clayey greensand. 2.4. Underlying strata: Upper Devonian shales, assigned to Bovesse Formation, in unconformable contact. Top of the Frasnian shales has become slightly weathered but shows no signs of paleosol development (Tourneur et al., 1988). 2.6. Area: Southern part of West Flanders, part of the Brabant Parautochton; probably extending into Tournai Basin but exact equivalency of strata is not demonstrated. 2.7. Thickness: 27 m in the stratotype 110W0007, delineated by geophysical well logs; 26 m in parastratotype 95W0153. Laterally the Nieuwkerke De Seule Member rapidly reduced in thickness and wedges out (11 m in borehole 096E0074 at Wervik, 0 m in borehole 096E0076 a Rekkem), whereas the overlying Nieuwkerke Noordhoek Member appears to be more persistent. 2.9. Discussion: The Nieuwkerke De Seule Member corresponds to the ‘Dièves moyens et supérieurs’ of the informal stratigraphic subdivision, characterized by glauconitic grey-green marls with phosphatic pebbles. The NCS equivalent is the Thivencelles Formation (Robaszynski et al., 2001). 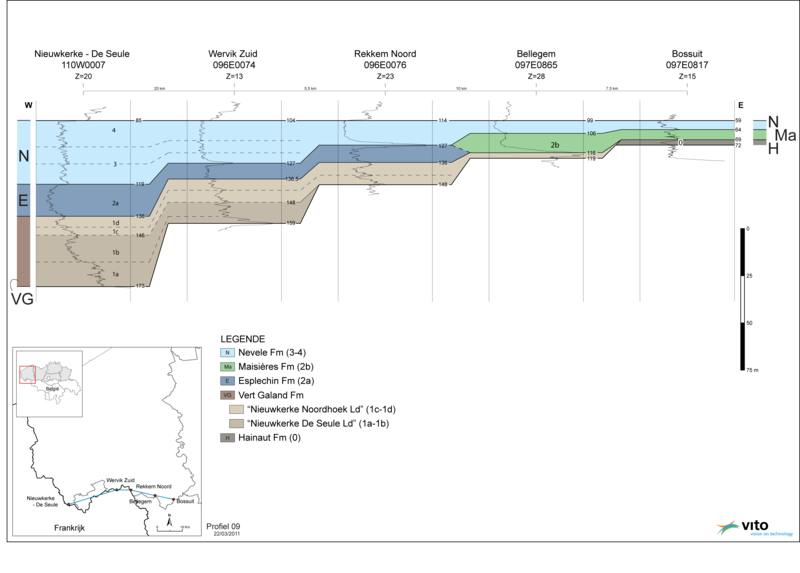 The corresponding mapping unit of adjoining map sheets of the geological map of Wallonia is the Bruyelle Member of the Vert Galand Formation (Hennebert & Doremus, 1997; Vanneste & Hennebert, 2005). 3.1. Name: Derived from Noordhoek hamlet, old commune of Nieuwkerke (Heuvelland), location of borehole 095W0153. 3.2. Stratotype: Borehole GeoDoc 095W0153, Nieuwkerke Noordhoek, drilled 1985 by VMW (De Watergroep) as their cored borehole K11 (top of cored interval 190,78 m, continuing into underlying Paleozoic section). Lambert coordinates x = 40880, y = 162250, z (ground level) = 32 m; depth interval: 169 - 192 m. Stratotype selected because of presence of a core in the lower part of this member (no geophysical well logs over this interval). Parastratotype: Borehole GeoDoc 110W0007, Nieuwkerke-De Seule. Lambert coordinates x = 40290, y = 157985, z (ground level) 19,5 m; depth interval 136 – 146 m. Parastratotype selected because of presence of a geophysical well log over the corresponding depth interval. 3.3. Description: Cuttings (95W0153) consist of bright green silty marl in the upper part, mixed with fine glauconitic sand in the lower part. The core consists of light greenish chalk with oxidized specks of iron sulfide, turning ino green silty chalk with clay laminations containing shell debris, with a basal layer of white very coarse-grained and porous chalk. The gamma-ray log allows to recognize two sequences in the Nieuwkerke Noordhoek Member, delineated by beds which show an increase of the gamma ray readings; these probably correspond to the more sandy glauconiferous base of a fining upwards sequence, grading into white chalks. Overall a steady increase in gamma ray level is observed from top to bottom of the Vert Galand Formation. 3.4. Underlying strata: Green silty marl of the Nieuwkerke De Seule Member of the Vert Galand Formation. The top of the green marl displays sliding planes (observed in cored section in borehole 095W0153). Because of the greater lateral persistence of the upper Nieuwkerke NoordhoekMember of the Vert Galand Formation, this unit may unconformably overlap Paleozoic strata (e.g. limestones of the Tournai Formation in borehole 096E0076 in Rekkem, Silurian shales in borehole 097E0865 in Bellegem). 3.5. Overlying strata: White compact silty chalk with dark flint nodules and light grey silicifications of the Esplechin Formation (Hautrage Flint Formation of the NCS scale). The contact with the Vert Galand Formation immediately appears by the colour change to green of the drilling mud. 3.6. Area: Southern part of West Flanders, part of the Brabant Parautochton; probably extending into Tournai Basin but exact equivalency of strata is not demonstrated. 3.7. Thickness: 23 m in the stratotype 095W0153, 10 m in parastratotype 110W0007. The thickness in the stratotype appears slightly anomalous as the average regional thickness is in the order of 10-12 m.
3.8. Age: late Turonian (presumed). 3.9. Discussion: The Nieuwkerke Noordhoek Member corresponds to the ‘Fortes Toises’ of the informal stratigraphic subdivision, characterized by grey to white marly chalk with green shine. The corresponding mapping unit of adjoining map sheets of the geological map of Wallonia is the Merlin Member of the Vert Galand Formation (Hennebert & Doremus, 1997; Vanneste & Hennebert, 2005). The NCS-stated equivalent to the Merlin Member is the Ville-Pommeroeul Chert Formation (Robaszynski et al., 2001). At this level there appears some ‘noise’ in the correlations between West-Flanders, the Tournai basin (where the Vert Galand Formation has been introduced) and the Mons basin (where the NCS stratigraphic scheme has been defined). The upper part of the Merlin Member would include whitish chalks with silicifications; in the West-Flemish boreholes such divergent lithologies are already assigned to the overlying Esplechin Formation. Some discrepancies in the interpretation will continue to exist as long as these strata are not properly dated in the boreholes from West-Flanders, nor properly described and correlated between the Tournai and Haine basins. Dusar, M. & Lagrou, D., 2007. Cretaceous flooding of the Brabant Massif and the lithostratigraphic characteristics of its chalk cover in northern Belgium. Geologica Belgica 10/1-2: 27-38. Felder, P.J., 1990. Bioclast assemblages in the Cretaceous of West Flanders, Belgium. Annales de la Société géologique de Belgique 113: 128-130. Felder, P.J., 1994. Bioklasten in het Krijt uit Boringen van West en Oost Vlaanderen. Geological Survey of Belgium Professional Paper 1994/3 N.270. Hennebert, M. & Doremus, P., 1997. Carte géologique de Wallonie à 1/25.000. Planche Antoing - Leuze 37/7-8. Notice explicative. Ministère de la Région Wallonne, Direction générale des Ressources Naturelles et de l’Environnement, 74 p.
Lagrou, D.; Dreesen, R. i.s.m. Dusar, M., 2011. Kartering en karakterisering (sedimentpetrografisch en petrofysisch) van de Krijtgesteenten in Vlaanderen. VITO, 2011/SCT/R/099, 96 p. + bijl. Matthijs, J., Lanckacker, T., De Koninck, R., Deckers, J., Lagrou, D., Broothaers, M., 2013. Geologisch 3D lagenmodel van Vlaanderen en het Brussels Hoofdstedelijk Gewest – versie 2, G3Dv2. Studie uitgevoerd door VITO in opdracht van de Vlaamse overheid, Departement Leefmilieu, Natuur en Energie, Afdeling Land en Bodembescherming, Ondergrond, Natuurlijke Rijkdommen, 21p., VITO-rapport 2013/R/ETE/43. Robaszynski, F.; Dhondt, A.V. & Jagt, J.W.M., 2001. Cretaceous lithostratigraphic units (Belgium). Geologica Belgica 4: 121-134. Tourneur, F.; Babin, C.; Bigey, F.; Boulvain, F.; Brice, D.; Coen-Aubert, M.; Dreesen, R.; Dusar, M.; Loboziak, S.; Loy, W. & Streel, M., 1988. Le Dévonien du sondage de Nieuwkerke (Flandre occidentale, Belgique - extrémité occidentale du Synclinorium de Namur). Annales de la Société Géologique du Nord 108: 85-112. Vanneste, C. & Hennebert, M., 2005. Carte géologique de Wallonie à 1/25.000. Planches Mouscron - Zwevegem 29/5-6 et Templeuve - Pecq 3/1-2. Notice explicative. Ministère de la Région Wallonne, Direction générale des Ressources Naturelles et de l’Environnement, 59 p.
Appendix: Profile 9 from Lagrou et al., 2011.